Superconductors are the holy grail of energy efficiency. These mind-boggling materials allow electric current to flow freely without resistance. But that generally only happens at temperatures within a few degrees of absolute zero (minus 459 degrees Fahrenheit), making them difficult to deploy today. However, if we're able to harness the powers of superconductivity at room temperature, we could transform how energy is produced, stored, distributed and used around the globe. In a recent breakthrough, scientists at the Department of Energy's Brookhaven National Laboratory got one step closer to understanding how to make that possible. The research, led by physicist Ivan Bozovic, involves a class of compounds called cuprates, which contain layers of copper and oxygen atoms. Under the right conditions—which, right now, include ultra-chilly temperatures—electrical current flows freely through these cuprate superconductors without encountering any "roadblocks" along the way. That means none of the electrical energy they're carrying gets converted to heat. If you've ever rested your laptop on your lap, you've felt the heat lost by a non-superconducting material. Creating the right conditions for superconductivity in cuprates also involves adding other chemical elements such as strontium. Somehow, adding those atoms and chilling the material causes electrons—which normally repel one another—to pair up and effortlessly move together through the material. 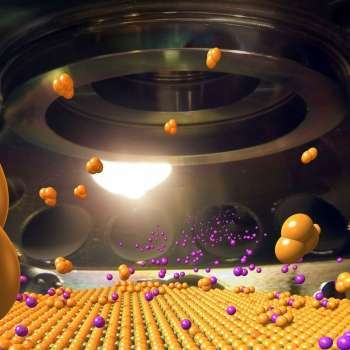 What makes cuprates so special is that they can achieve this "magical" state of matter at temperatures a hundred degrees or more above those required by standard superconductors. That makes them very promising for real-world, energy-saving applications. These materials wouldn't require any cooling, so they'd be relatively easy and inexpensive to incorporate into our everyday lives. Picture power grids that never lose energy, more affordable mag-lev train systems, cheaper medical imaging machines like MRI scanners, and smaller yet powerful supercomputers. To figure out the mystery of "high-temperature" superconductivity in the cuprates, scientists need to understand how the electrons in these materials behave. Bozovic's team has now solved part of the mystery by determining what exactly controls the temperature at which cuprates become superconducting. 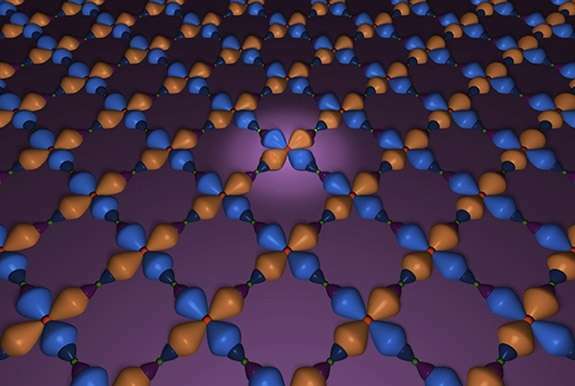 The standard theory of superconductivity says that this temperature is controlled by the strength of the electron-pairing interaction, but Bozovic's team has discovered otherwise. After 10 years of preparing and analyzing more than 2,000 samples of a cuprate with varying amounts of strontium, they found that the number of electron pairs within a given area (say, per cubic centimeter), or the density of electron pairs, controls the superconducting transition temperature. In other words, it's not the forces between objects that matter here, but the density of objects—in this case, electron pairs. The scientists arrived at this conclusion by measuring how far a magnetic field was able to get through each sample. This distance is directly related to the density of electron pairs, and the distance differs depending on the material's properties. In superconductors, the magnetic field is mostly expelled; in metals, the magnetic field permeates. With too much strontium, the cuprate becomes more conductive because the number of mobile electrons increases. Yet the scientists found that as they added more strontium, the number of electron pairs decreased until absolutely no electrons paired up at all. At the same time, the superconducting transition temperature dropped toward zero. Bozovic and his team were quite surprised at this discovery that only a fraction of the electrons paired up, even though they all should have. Think of it like this: You're in a dance hall, and at some point, you and the other people—who normally wouldn't be caught arm-in-arm—begin to pair up and move in unison. Some newcomers arrive, and they too pair up and join the harmonious dance. But then something strange happens. No matter how many more people make their way to the dance floor, only a fraction of them pair, even though they are all free to do so. Eventually, nobody pairs up at all. Why do the dancers, or electrons, pair up in the first place? Answering that question is the next step toward unlocking the mechanism of high-temperature superconductivity in the cuprates—a mystery that's been puzzling physicists for more than 30 years. RTS in consumer products better be able to handle higher temps or mechanical damage without a quench or exploding S7 batteries will pale in comparison. I think this isn't correct. While cuprates are 'high temperature' superconductors the 'high' only means that they require liquid nitrogen instead of liquid helium for cooling. While this makes them far easier to handle (and far cheaper to cool) it still means that substantial cooling efforts are required. That's technically correct only for DC and only if the load doesn't change. Any fluctuations in the current couple outside of the power line inductively and capacitively and cause parasitic losses. A superconductor may have zero R, but that doesn't mean it has zero Z. The conversion to and from DC for local distribution at the ends of the cable has a loss in a similiar range with ordinary AC lines. The advantage is that the DC line losses don't increase as much with distance, and with superconducing DC the loss would be almost constant regardless of the length of the wire. So, the lossless powergrid is an unrealistic fantasy, but with smart utilization you can reduce losses considerably. That is an illogical statement because that cannot be validly pictured; a power grid that never lose energy would look identical to one that does sometimes lose energy. What difference would lose of energy or no energy loss make to the visual appearance of a power grid? Energy lose is not something visible except in your energy bill. If you have IR goggles it can. But it's illogical on another level because you WANT a power grid to lose energy occasionally. A power grid that never loses any is not connected to anything (which would be pretty pointless for a power grid). So zephyr just why do think it is that actual physicists with actual titles and actual jobs would pass up an opportunity at nobel prizes and 6 - no 7! figure corporate jobs by simply producing this stuff and taking credit for it, rather than being quoted in physorg articles stating that 'it might just be possible some time in the future'? For that matter why would johan freddy prins not be already once and at same time be rich and nobeled already yet? Does KGB have makarov to head perhaps? Have you not some answers both in english and zephyr-speak or not just one? Yes or what? You are welcome. The physicists currently ignore at least half dozen of room superconductivity findings (http://www.jetple...7185.pdf in which mainstream science is working. The reason why no attempt was made to replicate them is because they are either obvious scientifically badly flawed or, worse, obviously fraudulent (usually motivated as an attempt to get research funding but sometimes just publicity). Thus there is nothing wrong with the way "mainstream science is working" but rather this rejection by science of obvious fraudulent/unscientific nonsense is an indication that "mainstream science is working" just fine. Good point; didn't think of that one. Just wait and see whats in the works. Hoooey! Hi folks. I have two different ideas here, idea *1 is to make lead bismuth carbide using a very simple procedure (untested) utilizing pyrolytic graphite and BiPb eutectic in a strong electric field while bombarding the graphite side with blue 445nm laser radiation to electromigrate . Its never been tried TTBOMK but should work as it "skips" over the thermodynamically forbidden transition that normally prevents PbC2 from forming, The resultant material should have a very high Tc at a narrow re-entrant band around 290K, may have accidentally made some while tinkering in 2011 and documented the resistance drop. I wonder if the reason this worked (once!) in my shed laboratory is that the solvent had some flukey combination of acetone and MEK? We still don't know why Pablo could get it to work and Kawashima et al but for some reason it didn't work in the bulk. It suggests that water contaminated with small amounts of Pb (ie from the pipes) might be the key and worthy of further experiments.